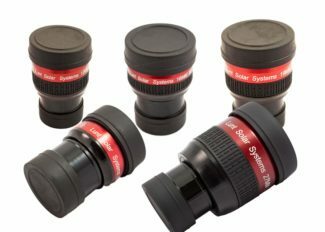 Orion’s heavy-duty SkyView Pro EQ sets a new standard for stability, precision control, and affordability in a telescope mount designed for the demanding amateur astronomer. A step up in rigidity and load capacity from the Orion SkyView Deluxe mount, the “SVP” supports telescope tubes weighing up to 20 lbs. It is every bit the equal of venerable Japanese-made mounts but at less than half the price. Its all-metal head features enclosed 360° worm gears plus large, 86mm-diameter setting circles for easy object location by celestial coordinates. Telescopes attach via a quick-release dovetail plate (included). The head glides effortlessly in right ascension and declination. Dual slow-motion knobs allow manual fine control, and an optional TrueTrack single- or dual-axis DC drive can be added for computerized tracking and astrophotography guiding (motor drives sold separately). Other features include an azimuth fine adjustment and a latitude scale. The mount accepts an optional polar-alignment scope (sold separately).